The above is a detail from the “cloister conspiracy”, a life sized sculpture in bronze by Philip Jackson, exhibited in his one man exhibition, the Sacred and Profane at the Bishop’s Palace in Wells, Somerset. 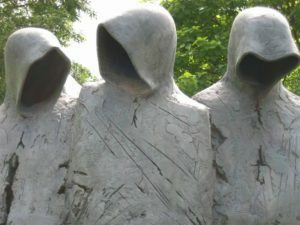 The sculpture, which is 73 inches tall in bronze shows four hooded figures, likely monks walking, three in front and one behind, leaning back as though resisting or repulsed, while the ones in front (pictured here) seem to turn to each other as though in conversation. Who the people are is not described, though the impression is that the could easily be walking down a passageway – a cloister – given their bearing. 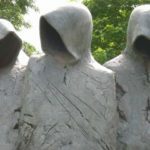 Or it could be referring to the “cloistered life” of monks – shut away from the world at large.